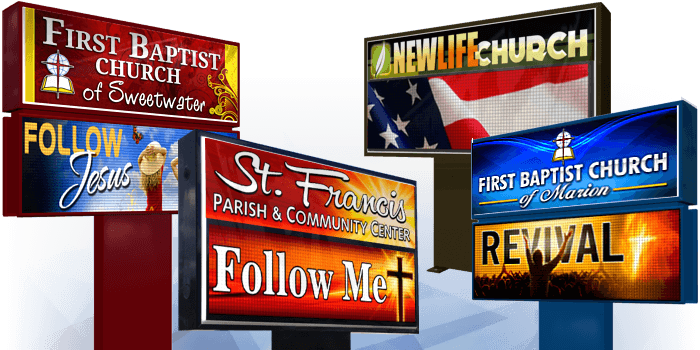 Dynamic outdoor LED church signs that will get you noticed. Our outdoor LED signs offer your organization state-of-the-art electronic sign technology combined with the highest level of quality and service! If you require extraordinary outreach into the community, your Stewart outdoor LED sign will deliver. A sign cabinet with an integrated LED display is protected by virtually indestructible Makrolon SL® polycarbonate. Single-piece LED display and sign cabinet. LED displays up to 12 feet wide. A separate, weather-controlled LED display with an optional identification cabinet ensures superior performance and reliability. Separate or independent LED displays. Any size display, billboard-size and beyond! High height and impact applications. We also proudly offer Indoor LED Signs & Video Walls! Stand out from the crowd with an LED sign!